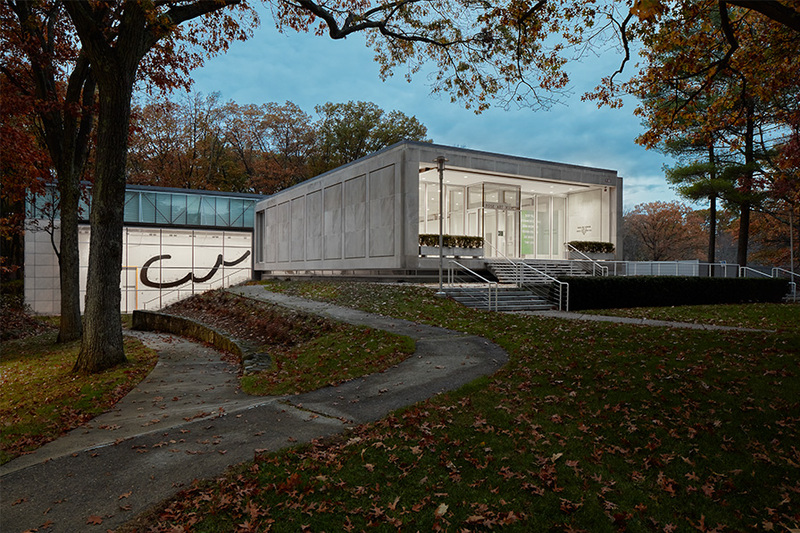 The Rose Art Museum is located on the campus of Brandeis University in Waltham, Massachusetts. Commuter train service is available from North Station (Boston) and Porter Square (Cambridge), Fitchburg/South Acton line, to the Brandeis/Roberts Station that borders the campus. When you enter campus through the main entrance, take a left. You will pass the Admissions Center and the round Spingold Theater Center, both on your left. The Rose Art Museum will be on your left, with Chris Burden's ﻿Light of Reason ﻿gracing the front lawn. See the Rose on the university's interactive map. Visitors may park in the front loop of the museum or in the adjacent Hassenfeld parking lot. Visit the Public Safety website for more information on parking. The Rose Art Museum is wheelchair accessible. The wheelchair accessible entrance is located to the right of the main entrance. We are happy to accommodate any special needs our guests have. Simply ask any museum employee, or contact Visitor Services Manager Robert Chester in advance of your visit. The galleries are closed to the public on Mondays, Tuesdays and holidays. The Rose Art Museum will be closed on April 20, 2019. Please complete our group visit request form at least three weeks prior to your visit if you plan to bring a group of more than 10 or for any groups that require special attention.